Stemettes has unveiled the Outbox Incubator programme to offer support and funding for girls aged between 11 and 22 who want wanting to launch their own science or technology-based business. In partnership with Wise, whose patron is HRH The Princess Royal, the programme is being funded by the Salesforce Foundation. In total, 45 girls will spend six weeks learning and living together in the Outbox Incubator house. Mentors will share their experiences of running a business and developing products, and the girls will learn how to secure funding to take their product to market. Nominated girls will present their ideas to HRH The Princess Royal and industry partners, pitching for mentors and funding from the industry. Participants will either have a science, technology, engineering and maths (Stem) idea, organisation, brand or product, or will have a publicly recognised Stem talent. 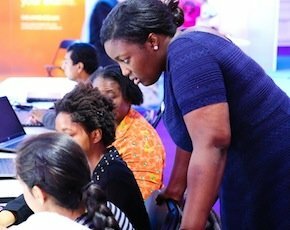 Stemettes was founded by Anne-Marie Imafidon in 2013 with the aim of inspiring more girls into technology careers. She has since reached 3,000 girls in the UK through public events, school workshops and industry-hosted schemes. “I am incredibly excited about this partnership and this programme. We are changing the course of history with this generation of girls,” said Imafidon. The Westminster Higher Education Forum highlights Stem skills shortage and maps plans for the future. Students aged between 12 and 14 expressed a need for more females in Stem subjects during 2014 TeenTech event. BCS president Liz Bacon creates network to encourage more women to take up careers in Stem. The programme will be made up of a threeweek “germination” period, followed by a public demonstration day on 15 August where angels and mentors will pledge money, time and support to the girls. The last three weeks will make up the “incubation” period. “The UK technology industry is facing a well-documented skills shortage, yet the number of women studying computer science at university is at an all-time low, said Salesforce area vice-president Melissa Di Donato. “This ground-breaking programme will make a real difference when it comes to encouraging girls to consider a career in technology – it is opening up a tangible career path they can aspire to. It’s so rewarding to be involved in mentoring these girls. I strongly encourage others to do so too,” she added. Sarah Shaw, Wise communications director, said the Outbox Incubator is an amazing way to help the girls become future stem stars and the company was delighted to be involved with Stemettes and the girls benefiting from the experience. “Showcasing these talented young women to our Royal Patron, HRH The Princess Royal and the Wise network will help raise their profiles and attract well-deserved attention, support and investment for their ideas and talent. We look forward to watching them grow,” she added. The Stemettes Outbox Incubator programme will run from 27 July to 5 September 2015.